We provide users more than 30 platforms to stream to for free, without displaying any third party ads on our service. However, maintaining such a big platform is a hard and expensive task! To assist us in keeping the majority of our platform free and without interfering advertisements, we have a couple of plans which will help you grow and reach your audience even faster or make your business more sufficient. Can I get a trial?! 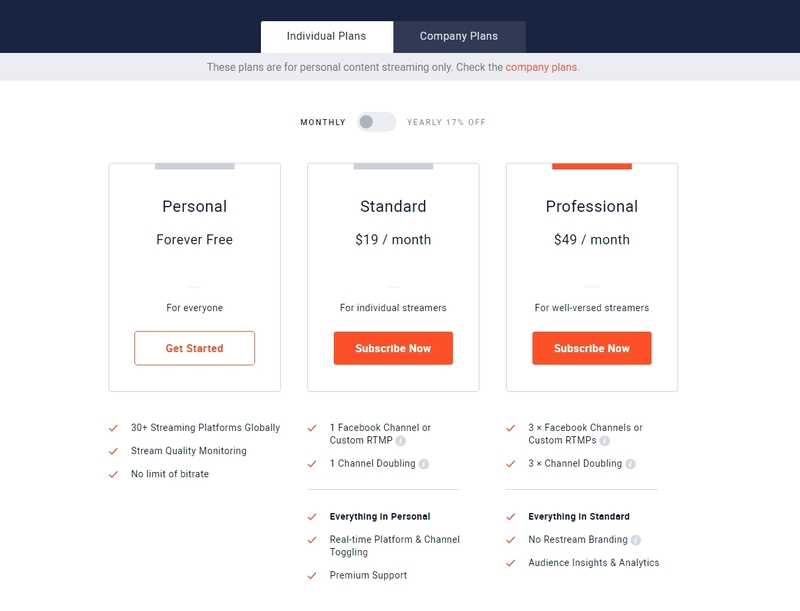 - We do not offer free trials for our paid services, however, you are free to get a monthly subscription and have a 7-day money back guarantee for every function separately, but only if you had not used it before. After 7 day period, your purchase considered as complete! 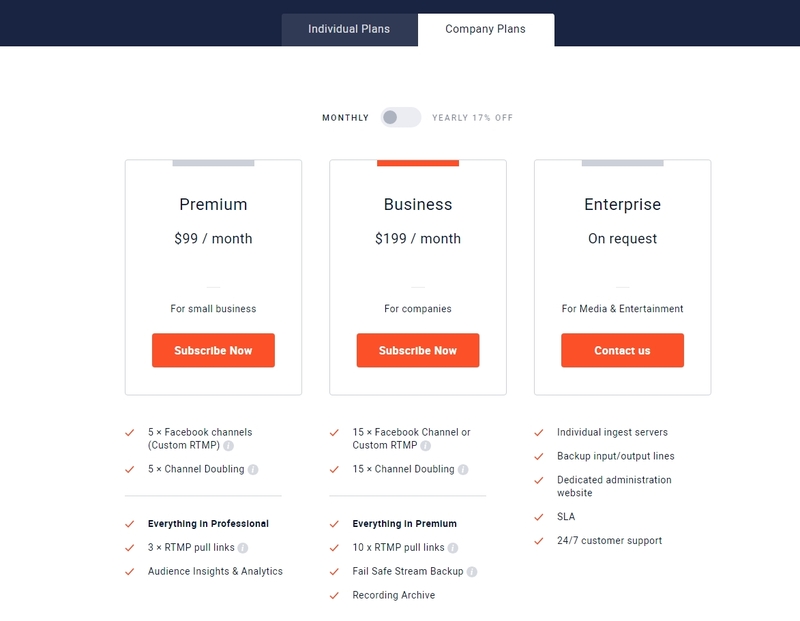 Let's check our pricing page which allows you to choose plans and apply special features to your account. The pricing is divided into two sections Individual and Company. First you will see the individual plans sections, where you can choose the plan for personal use only! There is also additional feature of Transcoding hours presented as add-on for your plan and more will arrive in the future. All plans include different amount of features and traits you can learn about by placing your cursor over the tool-tip icon. You can learn more about each of the features above by clicking on it's name and checking the guidance material about it. Important notice: If you need more than 10x channels for Doubling or Custom RTMP you should choose Business plan and if you need even more than 15, please, apply for our Enterprise. 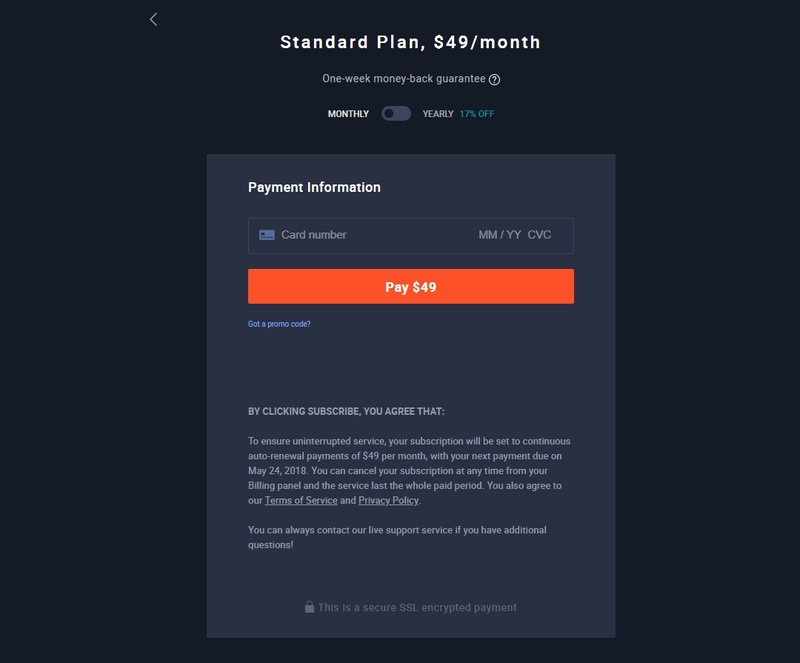 Monthly/Yearly option is the type of subscription, it means how it will be charged from your account - at the end of monthly billing period, or yearly. Enter your card data and click on "Pay" to proceed to the next step. You can also use a promo code if you have any, to get an additional discount! After deciding on the amount and type just click "Pay" button and wait for the system to process. Get a notification that your payment went well and enjoy your time using Restream! 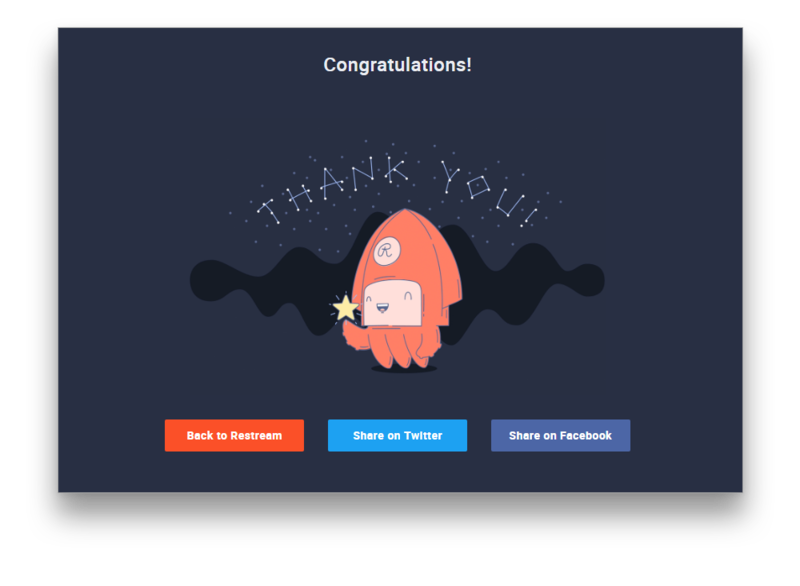 And Thank You for supporting Restream.io!